If you turn right into Queen’s Wharf Road and follow the river downstream you will come to the site of the first wharf to be built on the Brisbane River. In May 1825 the Moreton Bay Penal Settlement under Lieutenant Henry Miller was moved to Brisbane Town. 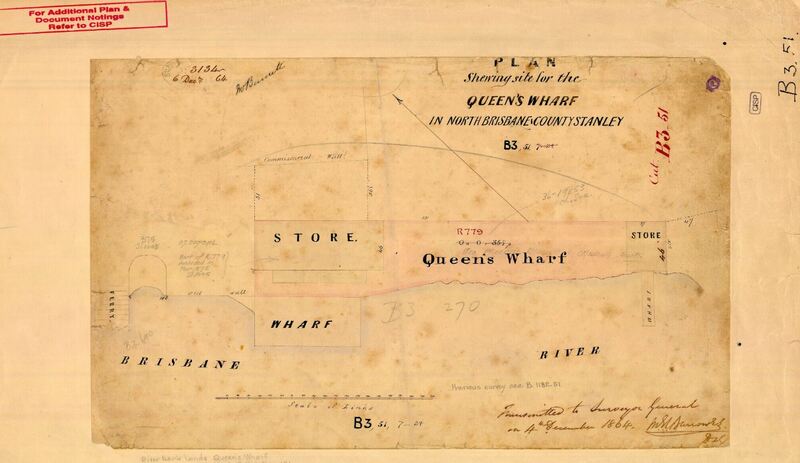 In 1827 King’s Wharf, which changed to Queen’s Wharf on the ascension of the new monarch in 1837, was built to service the settlement almost in front of the site where the Commissariat Store now stands. It featured a gantry and was built of timber. The wharf was the entry point to the town where convicts and their military overseers disembarked and provisions were unloaded. Virtually everyone and everything came by water. The wharf was also the disembarkation point for the non-military personnel who were allowed into the penal settlement during its latter years including Andrew Petrie and his family in 1837 who were the first free settlers to the settlement. In 1842 the penal settlement closed and Moreton Bay was opened to free settlement. When Thomas Dowse, a pardoned convict and free settler, arrived at the by-then dilapidated wharf in 1842 he thought he had landed “at the abode of damn’d spirits so unmistakably miserable did all the surroundings appear to his eyes”. With the arrival of free settlers a ferry service began between North and South Brisbane on 1 January 1843. With free settlement came the construction of the Victoria Wharf and Stores adjacent to the wharf and later an inn named the Queen’s Head. Nearby was the Ship Inn, by the 1860s the property of the well-known Patrick Mayne. During a flood in 1864 its foundations gave way and the walls collapsed, effectively removing all licensed premises from the Queen’s Wharf locale. In 1865 the Immigration Depot (now the National Trust building) opened in William Street. For this the old timber wharf was refurbished for the second time. William Pettigrew commenced a stream sawmill operation at the Margaret Street end of the Queen’s Wharf precinct in 1853. By the early 1890s Pettigrew’s mill buildings and timber stacks occupied all the land between Margaret Street and the Queen’s Wharf reserve. In the 1870s a classically styled Museum building was built which later housed the State Library. In the early hours of 7 February 1890, a landslip that commenced below the Museum destroyed buildings and structures including the old Queen’s Wharf. A second disaster befell the precinct in February 1893 when flood peaks sent water racing through its lower sections destroying Pettigrew’s business and others. Then came a third disaster. On the evening of 13 February 1896, the ferry Pearl departed from Queen’s Wharf and while avoiding the steamer Normanby was carried by flood currents into the anchor chain of the government steamer Lucinda and capsized. An estimated 30 people died. Today the Queen’s Wharf locale features a riverside bikeway. The North Quay ferry terminal services the Brisbane CBD having recently been re-built after being destroyed in the January 2011 floods.